The influence of US church institutions on the Ukrainian religious situation. Expert conclusion on the book M.A. Dorohoho "Biblical Philosophy. A short essay on the main problems of philosophy about the origin of nature, life, man (Philosophy, the Bible, Science). Comparative Review. 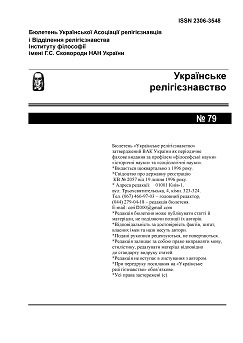 Review of the book by Janusz Marianski "Lexicon sociology of morality"
Expert opinion on "The Charter of Muslims Of Ukraine"
Considerations about the nature of the figure of Jesus Christ for Magazine "Worldview" with an analysis of the article by Academician Biletskyi OI "Some Notes on the Atheistic Literature of the Last Days (1960) "
Short report on the work of the Department of Religious Studies (2016).